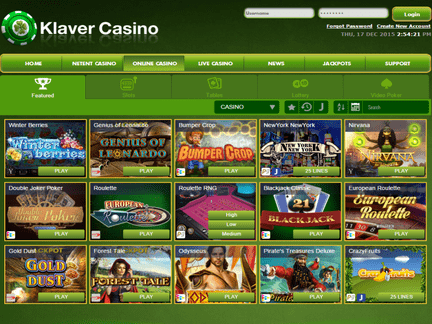 Klaver Casino welcomes the player with an Irish theme and background. The recent winners list displays the player's name, the winning amount and the game title. This information can definitely help in the game selection process. A high number of interesting games can be seen on the website. Best of all, the venue makes it possible to play live casino games in the presence of dealers. The support options are also nicely displayed in order to facilitate dialogue between the visitors and the staff. A sign-up bonus deal is the most prominently featured Klaver Casino Bonus deal. Basically, the player can receive a 100% bonus till €150. This means that the venue can match the first deposit with any amount, as long as it isn't over €150. There is a specific list of countries which are accepted for the bonus deal. The registration allows the player to choose the country of residence. In terms of currency choices, the € remains the only option on the scoll down list. A free spin deal is attached to the main deal. Twenty-five free spins are available for the famous Starburst game. The nice thing is that the profits from the free spins can be easily withdrawn. The player can make a deposit using a number of methods. These methods would include; Visa, MasterCard, Neteller, Skrill Moneybookers, iDeal and PaySafeCard. The Bank Transfer option is also available to players. However, the processing may take awhile, since the money must first arrive in the bank account. A feeling of trust is guaranteed by the careful selection of safety measures. The personal data is in good hands considering the fact that the casino has utilized the finest encryption methods. The verification of the player's account also takes place in accordance with MGA (Malta Gaming Authority) requirements. Residents of the following countries are prohibited from playing: Spain, United Kingdom, France, Belgium, Thailand and the United States of America. Those players who are visiting the casino from elsewhere may create an account on the site. The website is available in the English language. Therefore, the players from English-speaking countries are represented here in large numbers. The Malta license draws a lot of European visitors to the place. Klaver Casino highlights a number of games for the players. Some of the games are associated with the NetEnt software package. They would include; Fruit Shop, Flowers (The first two games have special Christmas editions on the website), Koi Princess, King of Slots, Pyramid Quest for Immortality, Blackjack, American Roulette, French Roulette, European Roulette, Single Deck Blackjack, Hooks Heroes, Dazzle Me, Sparks, Neon Staxx and Stickers. Here are some of the other featured games; Genius of Leonardo, Bumper Crop, Double Joker Poker, Roulette, Roulette RNG, 60s Blackjack, Gold Dust, Blackjack Classic, Odysseus, Forest Tale, Doubles, Gold Dust, etc. Glimmer Ltd has obtained a license from the Malta Gaming Authority. This is a trusted gambling licensing authority. The license from the Maltese authority carries much weight unlike the business licenses that some online casinos have chosen to obtain. The license itself was issued back in 2009. The casino has been operating for some time now. I found the selection of NetEnt games to be particularly exciting. It was also nice to see the seasonal editions of some of the games in association with the Christmas season. The promotions section was the least developed section of the website. It really seemed like the promotional offer was very small. I've seen much better deals at other online casinos. At the same time, the entertainment value of this casino is quite high! Hence, I could easily provide an endorsement.